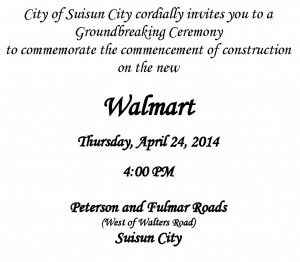 An official groundbreaking will be held at 4 p.m. Thursday, April 24, to launch building of the Walmart Supercenter on Walters Road that was unanimously approved by the City Council nearly six years ago. The 177,535-square-foot store, which is expected to open in Spring 2015, will feature a full line of groceries, including fresh produce, bakery, deli, meat and seafood, as well as general merchandise ranging from household goods to apparel, electronics and an outdoor garden center. The development at Walters Road and Highway 12 was approved in 2008 to provide a new major retailer within Suisun City where residents could easily make routine, daily purchases. A portion of the sales tax collected from those purchases will help fund basic city services, such as police, fire, parks and community services. Since the Walmart supercenter was approved, the City has weathered difficult economic times through a combination of belt-tightening, service reductions, hiring freezes and salary reductions while relying on money generated by the sale of surplus property. The new store will be open 24-hours a day, and will employ about 300 associates. Walmart officials said local hiring will begin about three months before the store opens. Information about working for Walmart can be found at www.walmartcareers.com. More information on this project is available through the Community Development Department website.